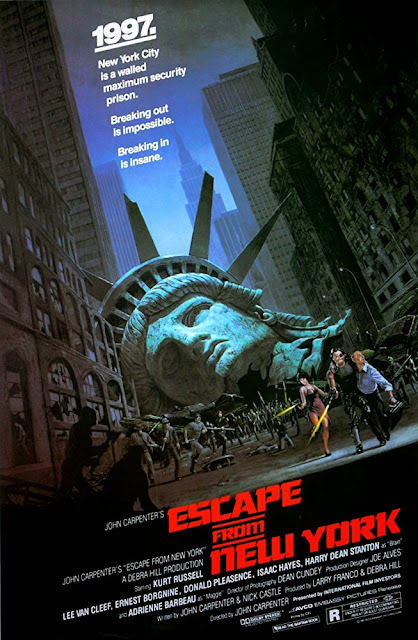 Movie: "Escape from New York"
New York has been turned into a mega prison that lets the inmates run free within its walls. When the President's plane crashes in Manhattan, a convict named Snake Plissken is asked to infiltrate the prison and rescue the POTUS in exchange for a full pardon. Kurt Russell makes everything better. "Escape from New York" is directed by John Carpenter, who has directed films like "Assault of Precinct 13," "The Fog," and "The Thing." He also helped write the screenplay along with Nick Castle. The year is 1997, which was 16 years in the future when this movie was made, but is now 21 years in the past from when we are writing this review. The President of the United States (Donald Pleasance) is carrying a speech to help ease escalating tensions between NATO and the USSR (which oddly enough wouldn't exist in real-life 1997, but who could have seen that coming?). When Air Force One crashes in Manhattan, which is now a maximum security prison full of violent criminals serving life sentences, the POTUS is taken prisoner by the criminal who runs things inside the prison's walls. In the hopes of sneaking someone inside without a lot of fanfare, the government brings in a bank robber and former Special Forces soldier named Snake Plissken (Kurt Russell) to get the president out of the penitentiary safely before the NATO security summit is over. If Snake succeeds, he will be granted a full pardon. If he fails, he doesn't face prison but faces losing his life. One thing's for sure: when it comes to "Escape from New York," it is far more style over substance. The story and characters are relatively thin, which is true for a lot of John Carpenter's movies. It follows a simple rescue narrative with a forced ticking time clock in the form of a micro-bomb in Snake's neck to add higher stakes and a skosh more tension. The characters are caricatures more than anything else. The acting is almost entirely one-note, and there is no nuance to be found anywhere. It helps that Kurt Russell is so goddamn charismatic, even when doing his mean, tough guy anti-hero shtick. With any different actor playing this lead role, we might question if this film would even be watchable. 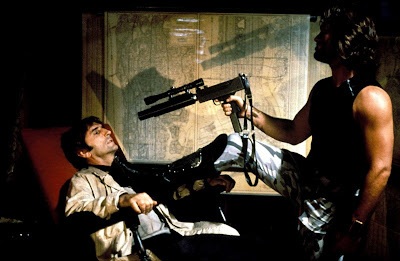 All of this being said, the best thing about "Escape from New York" is its dirty, sleazy, grimy post-apocalyptic, slightly futuristic aesthetic. The art direction, costumes, and makeup work help make it as appealing as it is. In fact, it is the look of this film that makes it memorable. Sure, there is some entertaining action, but it doesn't do much in that area to distinguish itself from the herd of other sci-fi action films that have populated cinemas in the years before or after its release. It also lacks the same level of intensity some of Carpenter's other better projects have had in the past, and we feel like this absence of tautness hurts the movie overall. 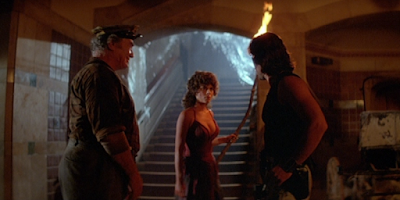 We know "Escape from New York" is considered a B-movie cult classic, but in this case, it is a cult we have yet to join as we are still somewhat lukewarm on this John Carpenter offering. We owe most of its success to Kurt Russell, who puts on a hell of a performance as Snake Plissken. Without him, this would have been a whole heck of a lot harder to watch.